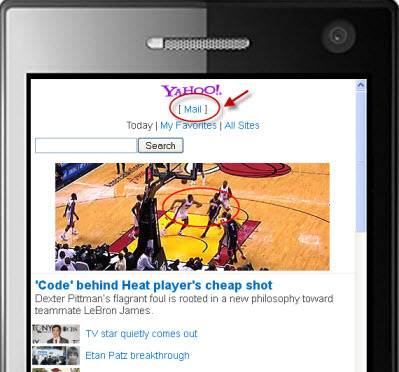 You can access your Yahoo Email from your Android or IOS mobile phone or tablet. Web browser access is the most popular ways of accessing email on a PC/laptop, and is easy to do on a tablet/smart phone as all you need to do it connect your web browser to the Yahoo mobile mail site. The web address of the mobile site is different than the address you normally use when accessing from your PC and is m.Yahoo.com. Here is what you see when you connect. Notice how the page layout is much simpler than the standard yahoo web page reflecting the fact that the mobile devices have limited screen size. Just click the mail link and login to your email account. However because of the screen size and the desire for email notifications this access method is rarely used on tablets or smart phones. Smart phones and tablets come with a default email client (Apps) that you can use to connect to any email provider using POP3, IMAP4, SMTP and http protocols. The setup is almost identical to configuring a desktop based client like outlook express, outlook etc on your PC. it offers more features than the default email Apps , and is much easier to setup. 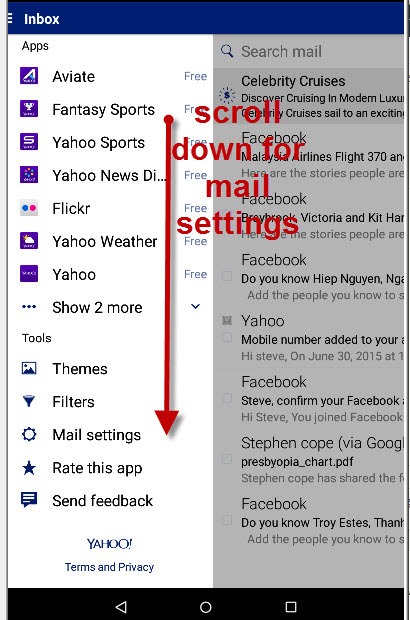 Note: The setup is different for the Yahoo Mail App and a default mail App..
Before you begin the setup of Yahoo email on an Email App other than the Yahoo App you will need some basic account information. If you are using the Yahoo mobile App then you will not have to enter all the details as they are pre-configured in the App. SMTP server- This sever is used to send email. 1. IMAP is the preferred access method as it will leave email on the email server and you can then access it using another client e.g. your desktop email client. 2. Authentication for SMTP is required. 3. Your full email address is used as the account name. When Setting up the Yahoo App you only need to enter your email address and password. 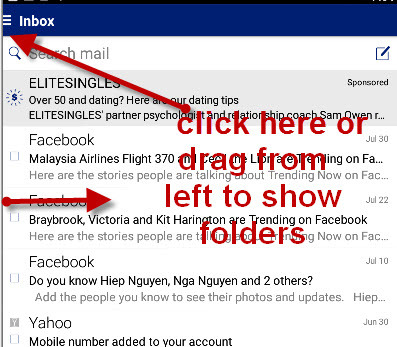 When you open your Yahoo mail App the App will open with your inbox displayed. To view your folders click on the menu icon (top left) or you can press and drag from the left side of the screen to open in split view,with folders on the left and contents on the right. If you click on mail settings the settings screen opens. The default settings are usually OK, and probably don’t need changing. 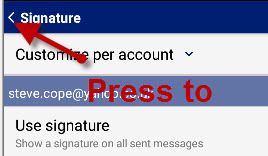 If you want to use signatures on email sent from your Yahoo App then you need to click on signature settings and then edit signature. 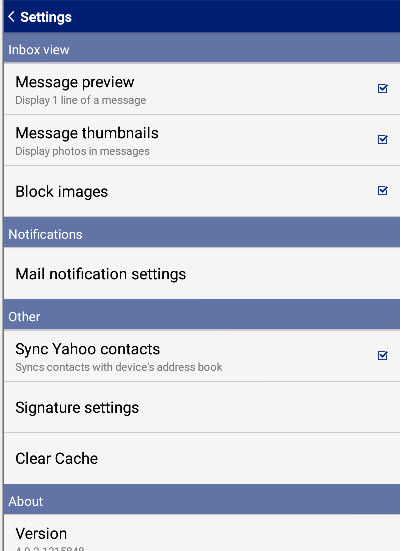 By default the sent from Yahoo Mail on Android signature is enabled. If you need to go back to a previous screen look in the top left corner for a left facing arrow. 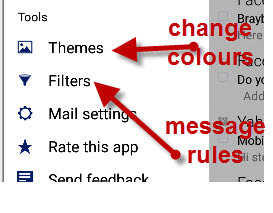 If you don’t like the colours then click on themes (just above mail settings to change the colours. Q- Where is the email stored? A– It is stored on the Yahoo Email server and not on your phone/tablet. A- On some devices you will find that only the latest messages are displayed and accessible. There is usually a setting to let you view all messages. Q- I have sent an email from my App can I view it in the sent items using my PC and a web Browser. A-Yes the App and the browser use the same email folders which are all located on the Yahoo email server. Q-Can I read email when offline? A -Yes if they have already been synchronised with your device.